Dmytro Shutkov turns 44! We are sending our greetings to the birthday boy and wish him sound health, peace, prosperity and new achievements. - Dmytro, you have dedicated your entire player career to Shakhtar, having been working for a few years as a member of Mircea Lucescu’s coaching staff. How has your outlook changed after undertaking coaching duties? - A player is responsible for himself, while a coach is responsible for his charges. In my opinion, the work of the coach requires more responsibility. Besides, I used to think that it’s tougher for the players, because of great workloads. But now I think that it’s even harder for the coaches since they are under even greater pressure, in psychological terms. 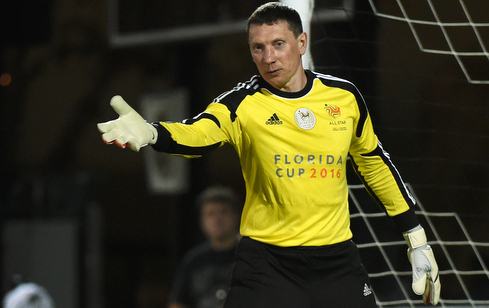 - Could you name the three main components of a successful goalkeeping career? - Mental stability, physical strength and a good mentor. - These days, the training process of Shakhtar goalkeepers is different from the one when you played? - Previously, they payed less attention to such a component as footwork. Nowadays, in this respect, the goalkeepers have got equal with outfield players, with some even surpassing the latter. In training, we offer the goalkeepers a great many exercises in this activity line. We also pay attention to psychology. Back in my time, the player had to cope with psychological pressure on their own. - What do you do in the situation when some of your charges plays unsuccessfully? - The match is over – ‘the train has left the station’. Therefore, shouting and blaming them makes no sense: the goalkeeper perfectly understands himself that he played poorly, being aware of the kind of error he made. You just need to make match analysis and draw conclusions for the future. I'm not advocating the following approach: “I wouldn’t have played like that in your situation.” There is no goalkeeper who never makes mistakes, there are just ups and downs. I try not to make myself look important, demanding the same from the lads. - Was the transition from player to coach hard for you? - To be honest, it was not easy psychologically. For many years I used to live one lifestyle, and then it all ended up. I am very grateful to the club management for their support. After the end of the season 2007/08 and a short break, we gathered together at the base, and Mister offered me to stay in the team as a coach. At the time, I did not even have a licence, I only had playing experience. I began to delve into the new job, assisted to Marianu Ionita and simultaneously attended a coaching course, during the winter break, when I had some free time, I also conducted training sessions at the Shakhtar Academy - 3-4 sessions per day. Now I have the A category. According to UEFA requirements, starting from 2019, the goalkeeping coaches in Ukraine will be required to have a special licence. In a short while, on 11 April, I am going to attend the new course to last for about six months.